There was some discussion about lock miter bits on Rick M’s Deals thread. I didn’t want to muck up his thread with off-topic conversation, so I am tossing this out there for anyone who is not certain about setting up lock miter bits. 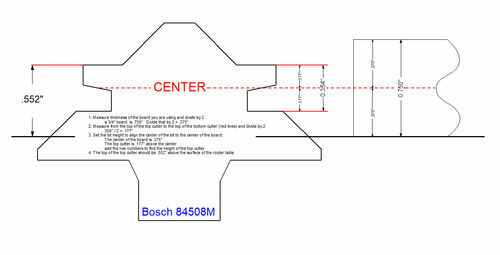 First, a diagram (the numbers shown are for the Infinity Lock Miter Jr. Router Bit item #55-502). Note that the markings are for reference only and, particularly in the case of the fence location, don’t precisely represent the actual set up. That is, the fence would never be set that far back. 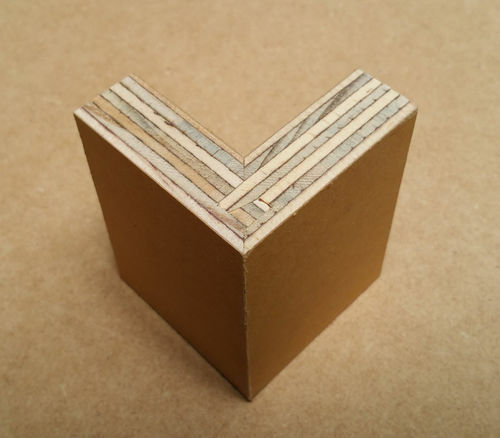 The key to getting a correctly aligned joint is to have the two orange lines shown on the diagram an equal distance from the outer face of the boards (outer meaning the faces that are on the outside of the joint when the boards are put together). Those orange lines mark the center of the bit both vertically and horizontally. However, it is most desirable for the joint to be centered on the board, and it’s also the best way to get an easy and consistent setup. By adjusting bit height and fence setback so that those lines match the center of the board, you will get a centered lock miter joint. My preferred way to handle router bit settings is to pick a point on the bit and measure its height when the bit is properly adjusted. 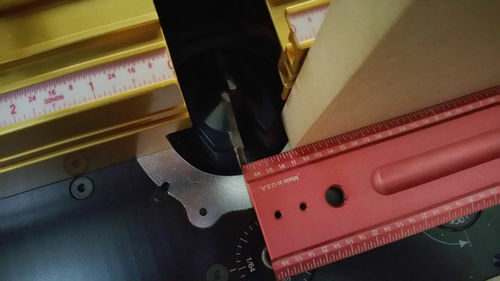 For example, on round over bits, once they are adjusted for a good cut, I measure and write down the height at the top of the bearing screw because that spot is most accessible to get a height gauge on. The next time I use that bit, I set the height to that value, make a test cut and it’s ready to go. The lock miter bit has an extra element though, because the fence has to be set correctly too, in order for the joint to line up. For getting it set, I use the top of the bit for bit height, and the tip of the lock groove cutter for getting the fence right. As I said, the numbers in the diagram above are specific to that Infinity bit. 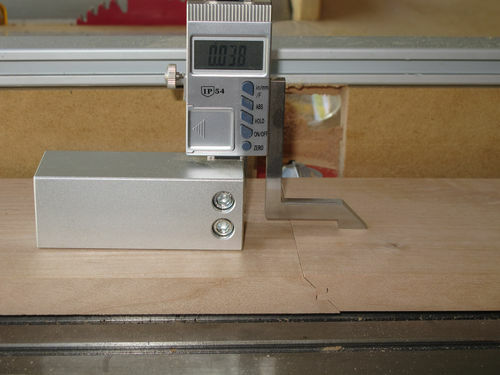 But, you can apply the same technique for any brand by using test cuts to get the bit set properly, and then measuring the bit height and distance from the fence to the tip and making up your own formula based on the thickness of the board. Remember that it’s the thickness/2 that matters, so take the measurements you get for height and distance to fence and subtract half the board thickness. Those are the amounts you will add to thickness/2 for other board thicknesses. 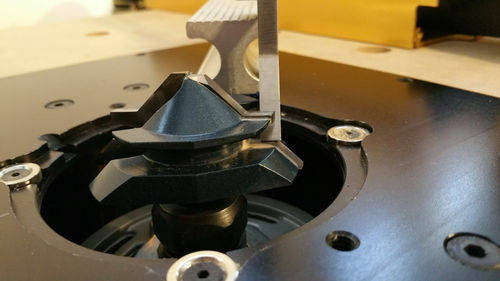 If you are having trouble getting a good joint on your test boards, the easiest thing to do is separate the bit height adjustment from the fence adjustment. That way you’re not fighting two variables at once. 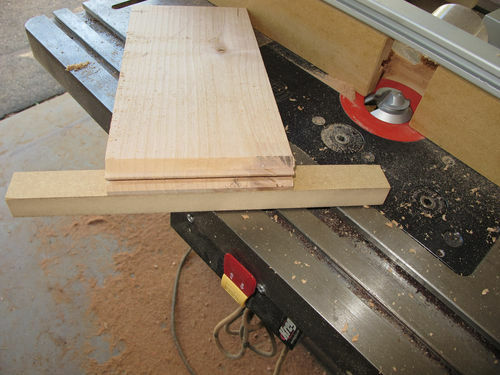 To do this, take two boards and first run each edge with the board flat against the router table top. Flip one board and slide them together. 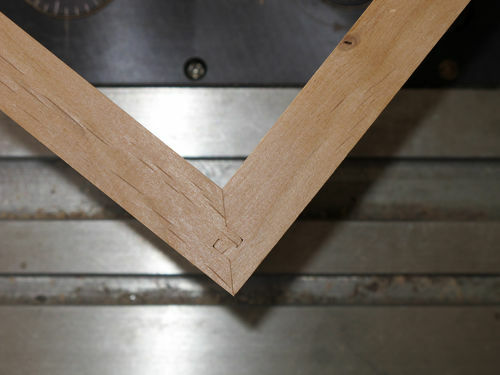 If the faces are flush, the bit height is set properly. First off, I’ve built a couple of fancy jigs for managing the boards that wound up in the trash. Ultimately, I found that guide sticks attached flush to the edge with double-stick tape does best. Here is the routed board. 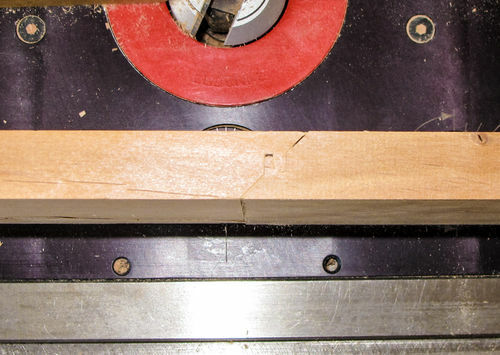 After routing the second board, when placed end-to-end, you can see the error. The great thing about this is that the offset is double the error of the bit height. You can measure it and adjust the bit based on that. Offset was 0.038, so adjust the router 0.019. ...and the alignment is correct. Adjust the fence. Make two cuts with the boards flush to the fence. You can do the same measurement of the board offset, halve it, and get what will probably be your correct setting on the next pass. The fence is tougher to get set right since you have to move it by hand. Be sure to measure and make note of the distance from the fence to a repeatable spot on the bit. Also note the height of the bit. You can now take the fence and height measurements, subtract half the board thickness and have the correct setting for other board thicknesses. Write those down and keep them with your bit. Thanks Rich for taking the time to make this blog. Favorited, saving for reference. Very good blog…what digital height gauge are you using. 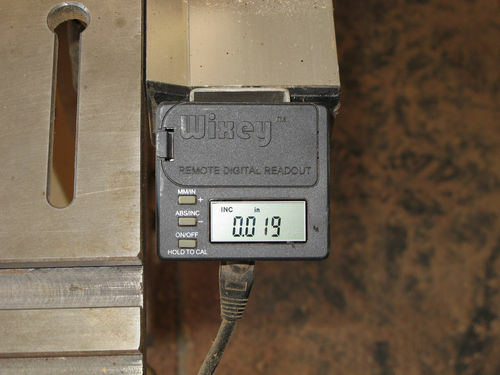 It’s the iGaging Digital Electronic Height Gauge. Its design makes it easy to get into places for measurements. This is interesting Rich. Very handy. So are you saying the expensive little red aluminum bits were a waste or are they useful at all? It was useful for me in that it gave me a visual understanding of what’s involved in using the bit. Those bits aren’t intuitive until you’ve played around with one for a while, and without the little red gauge, it would have taken me longer to get a feel for it. I don’t use it for setup anymore though. 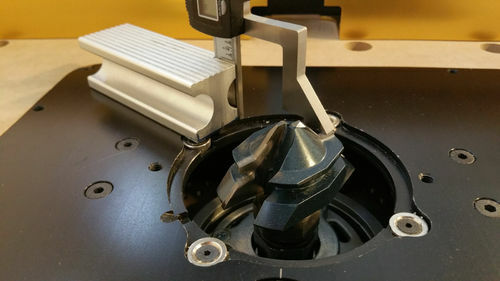 It’s just not precise enough, and I can get it done in a fraction of the time with my measurement system, and have never needed to make more than one test cut. The price is a ripoff though. $30 is at least double what it’s worth. It’s a total rip off. Should be $10 a pop and that’s still spendy but probably worth it. Either way, I’ll play with this soon. I have a couple projects on the bench to finish and then tons of small log milling to do. Then I’ll play. I need more time! added to favorites. thanks! Ive always wondered about this style bit but have stayed away from it do to the horror stories Ive read with the set up. As mentioned, the center of the lock miter bit needs to be aligned with the center of the workpiece, both horizontally and vertically. But where actually is the center of a lock miter bit? You only need to do this one time for YOUR bit. 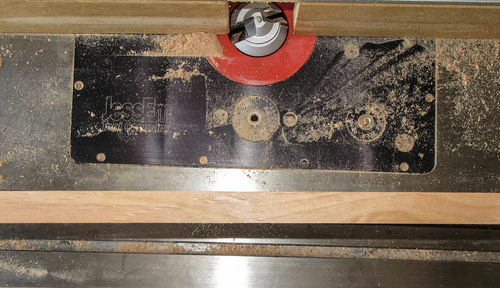 You want to measure to the top edge of the top cutter and the distance of the top edge of the bottom cutter. (red lines on the right in my diagram) The exact horizontal center of the bit will be in-between those two edges. A little math – subtract the bottom number from the top number and divide the result by two. In the case of my Bosch bit the center is .177” below the top edge of the top cutter. 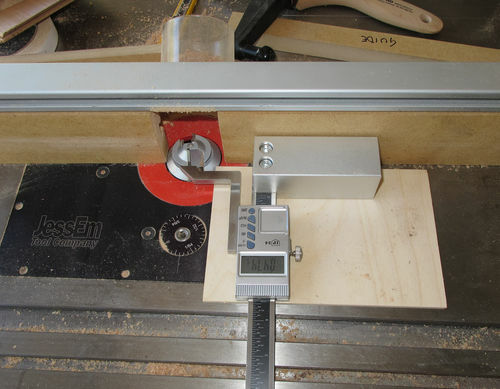 Just add the two numbers together – half of the bit measurement and half of the board measurement and you will get the height that the top edge of the top cutter needs to be above the router table. 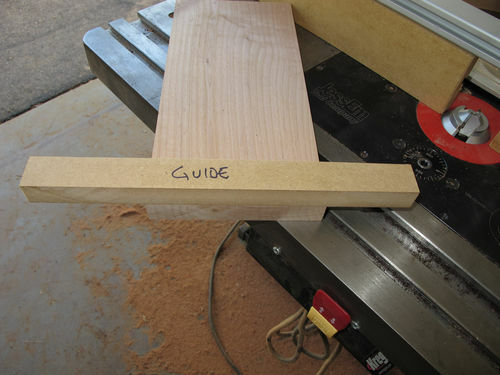 In this example using a true 3/4” (.750”) board, the top edge would be .552” above the router table surface. Not out of line at all, John. You’re a man after my own heart. Every setup I do is based on the numbers. I’m happy to see another woodworker going about it the same way, and thanks for contributing to my post. Your input is welcome and very helpful. It’s always valuable to be able to see different ways to get the job done. The trick with both of our methods is that, if followed, you’ll get a perfect joint first time, every time. I still do a test cut if it’s expensive wood, but since I started doing it my way, I’ve never had to make an adjustment. So, does this setup block eliminate the math or help in the setup? It’ll help you get in the ballpark. In the end though, board thickness divided by two plus a value isn’t heavy duty math. You do need a good height gauge though. The best thing to take away from this blog post is to separate the bit height and fence depth setups. I almost gave up until I realized how to do this, since dealing with both variables at once is mind blowing. Again, that setup block will get you most of the way there, and if you prefer not to do calculations and don’t have a height gauge, it’s certainly a useful setup tool to start with, and tweak the bit height and fence setting from there. 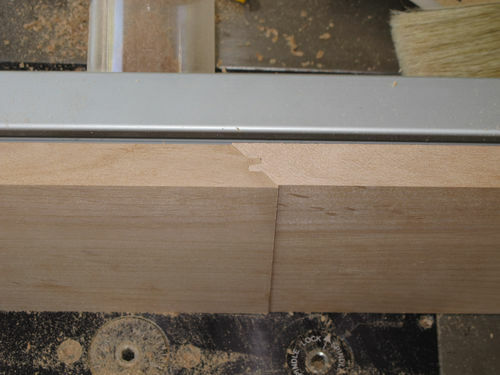 Any way you do it, the lock miter bit is nice because once you get it set, you can do countless joints that will glue up perfectly. Cool, thanks. I guess I can spring for a height gauge since I’m not spending $350 on a sooper dooper Rockler pooper dado stack. Plus it seems that is only good for plywood. Time to butcher a few prototypes. So…..after some research…..Tell me if my thinking is flawed. Minimal cost and stress. To try some prototypes I can get an open box Katana (people seem to like them) bit for $36 and an Infinity Lock Miter Master Jig for $29, (no height gauge expense). If all goes smoothly I’ll grab the Infinity bit when the Katana wears out.